If you’re looking for legal advice about the estate law, retain my firm, The Law Office Of Skipton Reynolds. I take a personal and attentive approach with each and every client. I’ll listen to your concerns and advise you about the state and federal regulations that may affect your future. I take pride in helping my clients navigate the myriad laws that can apply to their estate. If you’ve worked hard for your property, I can proactively advise you about ways to reduce the taxes that you may have to pay. I can help you plan for the future by discussing your rights and obligations. When you need long-term care provisions or a living testament, I can draft documents that respect your best interests. 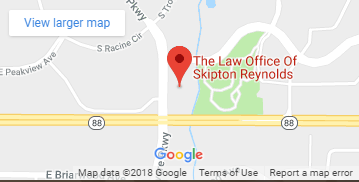 To accommodate your schedule, The Law Office Of Skipton Reynolds has flexible business hours during the week. I take pride in helping my clients in the Denver Metro Area safeguard the things that they’ve worked hard for. To request your initial consultation with my estate law firm, call today.